I use an iMac running High Sierra 10.13.6. I use the command line a lot and recently its developed a problem. I would use the left or right arrow key to move the terminal cursor along a previous command or line. If I made a mistake in a long line I was typing on the command line I would hold down the left arrow key and the cursor would quickly move along the line until I got to where the mistake was. That has stopped happening. Holding down the arrow key takes a second or more to move a single space. Continuing to hold it down is just too slow. It's much faster now to just repeatedly tap the arrow string. This is very frustrating and time-consuming. Does anyone know what happened? The arrow keys used to work fine. I've tried restarting but that hasn't helped. This also happens in text windows and other applications. Not the answer you're looking for? Browse other questions tagged macos terminal keyboard . How to customize .inputrc to make Command-Delete and Option-Delete delete lines and words in iTerm 2? 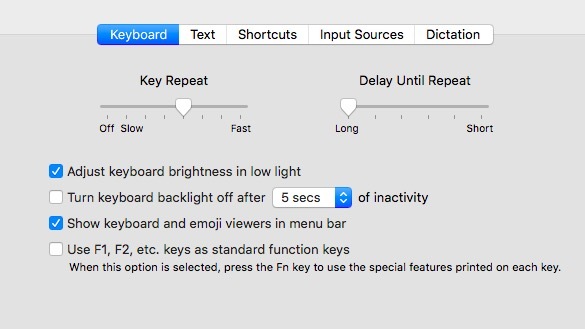 Which “Go To Top/Bottom” shortcut to use: Fn-Left/Right vs. Command-Up/Down?